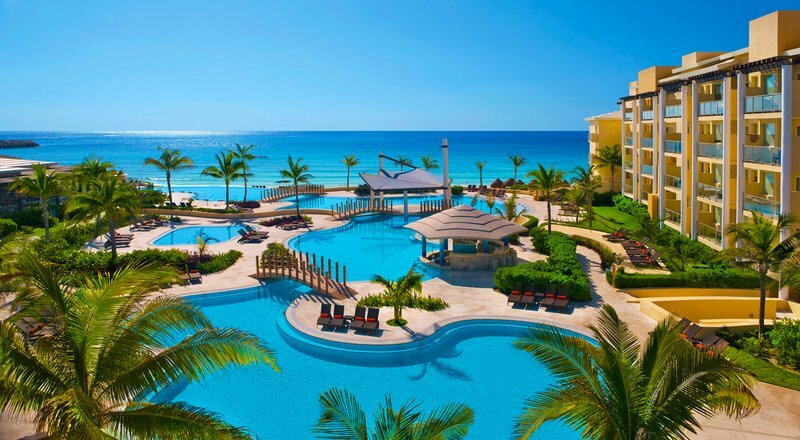 The Now Jade Riviera Cancun is an unlimited luxury resort located just 12 miles from the Cancun International Airport. Enjoy endless daytime and nighty entertainment, spacious suites, exquisite cuisine, and so much more. Sophisticated accommodations of varying levels endure the highest level of comfort. Choose from junior suites with tropical, ocean, and ocean-front views or other preferred suite options. Additionally, a family suite is available for plenty of space. Suites include 24-hour room and concierge service. Other suite amenities include WiFi, iPod docking station, Jacuzzi for two, and a mini-bar that is refreshed daily. Eight gourmet restaurants, including a buffet and café,serve a variety of international cuisines. The six a la carte restaurants specialize in Italian, Mediterranean, French, Asian, Mexican, and sandwiches. Guests can enjoy these restaurants with the ease of no reservations. Additionally, six bars and lounges are located around the property serving unlimited top shelf spirits. Guests will enjoy every minute of their vacation with the various activities and entertainment options available. There are three pools of which one is an adult’s only pool and one is a kid’s pool. Other activities for guests include playing tennis, golf, beach volleyball, water volleyball, board games, water aerobics, and participating in yoga. Water activities including kayaks, snorkeling, windsurfing, and deep sea diving are also available. Many salon treatments and packages are available at the world class Now Spa by Pevonia. Choose from various options of facials, body wraps, and massages. Furthermore, there is a fully equipped fitness center open daily for those who would like to stay fit while on vacation.